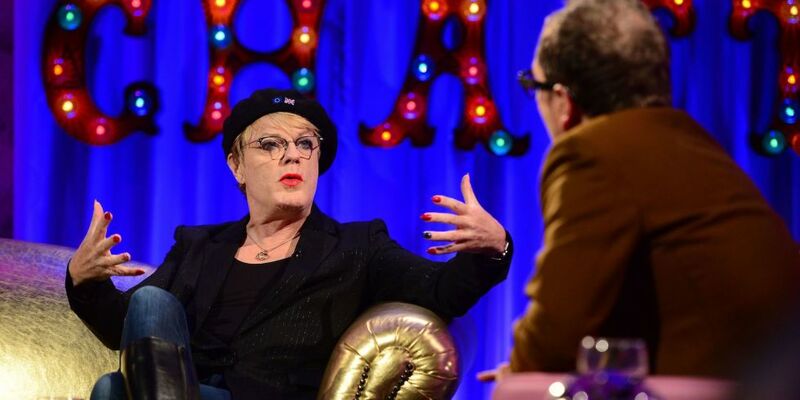 Who is Eddie Izzard, Is He Transgender or Gay, How Much is He Worth? Haven built a fortune for himself as an actor, comedian, writer, and political activist, Eddie Izzard is certainly a person of interest. He made the headlines because of the drama that followed his change of sexual status. He is regarded as one of the most prolific comedians the British world has ever produced and is also noted for his transvestism, pantomime, and monologue. This article contains all there is to know about him. Eddie Izzard has gained fame as a stand-up comedian, actor, and writer. He has also taken interest in the political world as a political activist. As a comedian, Eddie has delighted his audience on different platforms where he uses the form of rambling, waggish monologue and self-satisfying acts to create hilarious scenes. Despite being an English comedian, he has performed on various stages including befor French and German. Sometime in the year 2007, he topped as the third Greatest British national comedian on the 100 Greatest British National Comedians. As an actor, Eddie Izzard has played roles in a lot of movies, in a few he played as the director and producer and he has also voiced role in a others. He has acted in over twenty films including The Oncoming Storm (1995), The Secret Agent (1996), Velvet Goldmine (1998) and lot more others. As an author, he has written just one book titled Believe Me: A Memoir of Love, Death, and Jazz Chickens (2017). Eddie as a political activist has contributed greatly to the British world, he started out as a Pro-European union campaigner. During these periods he aired his views on the integration of the UK into the European Union. Because of his acts on promoting modern language and tolerance of other cultures and lifestyles, he was awarded an honorary; Doctorate of Letters from the University of East Anglia, Norwich. In his earlier days as a political activist, he donated more of his income into growing the Labour Party and has still maintained that voilition. Afterward, he ran for the position of the National Executive Committee for the Labor party but unfortunately, he lost. Few years down the lane, he was later elected as the Honorary President of the University of Sheffield Student’s Union. His loss in the Labour Party didn’t deter any of his contributions to the growth of the party. He ran for the same position in 2017 but yet again lost. It was at age four that Eddie Izzard knew that his career would certainly be formed in the entertainment industry. At birth, he was named Edward John Izzard, born on 7 February 1962 in the Colony of Aden. His mother, Dorothy Ella, made her incomes working as a midwife and a nurse while his father, John Micheal Izzard worked as an accountant with the British Petroleum. Eddie is one of two siblings and is the younger of the two. He spent a few years of his tender days at Bangor and Skewen. Unfortunately, he lost his mom to cancer when he was six and while she was ill, he and his older brother Mark, created a model railway in a bid to distract their attention from their sick mother. Today, records have it that the rail was donated to the Bexhill Museum. His father couldn’t just handle the loss of his wife and training the boys, so to make it easier, he sent Eddie to a boarding school; St John’s School, he later transferred to St Bede’s Prep School and attended Eastbourne College. Later on, he spent a year studying Accounting and Financial Management at the University of Sheffield. Is He Transgender or Gay? The simple act of watching a set of sisters force their brother to wear his clothes instead of a feminine wear sprung up the desire of being a transgender for Eddie Izzard; when he was just seven. Initially, Eddie began projecting himself as a transvestite, he often preferred wearing women clothing. His act of being transvestite didn’t stop his love for women. As time went on, he declared himself as a transgender, in his words, he believes he is a lady trapped in a man’s body. In 2017, it was rumored that the comedian had a breast implant after he stepped out with a puffed chest, nevertheless, he has disregarded these claims saying that it was just a padded bra. So many people have aired their views about his claims and records have it that his transition may certainly affect his political dreams. On Eddie’s part, he doesn’t care about the views of anyone and has claimed that he sure has a right and choice to choose whatsoever path he decides to tread on when it comes to his sexual status. Regarded as one of the prolific comedians in the world, Eddie despite his drama’s has gained attention to himself and also has made a fortune from his comic acts. He has a net worth of $20 million.